∙ Consuming raw cannabis as a vegetable, or by juicing it. Because many of these preparations have never been properly studied by medical scientists, most of what we know about them is based on experiences by actual patients. Depending on the choice of administration form, many changes to the original chemical profile of the plant material may occur. For instance, a common factor of most administration forms is a heating step, which is essential for conversion of the cannabinoid-acids into their pharmacologically more active form (explained in more detail below). Overheating may lead to the formation of degradation products such as Cannabinol (CBN) and Delta-8-THC, both of which have potential pharmacological properties of their own. Volatile components such as the terpenes may easily get lost by evaporation, for example during the boiling of tea, or while concentrating an extract by evaporating the solvent. On top of this, each preparation comes with its own efficiency of uptake (by intestines or the lungs) and its own set of specific metabolites formed upon consumption. Especially the difference between oral (ingested) and pulmonal (inhaled) preparations are of importance here. After all, inhaled cannabinoids and terpenes enter directly and unaltered through the lungs into the bloodstream, while ingested compounds are significantly delayed and altered by the actions of the intestines and the liver. The combination of all these factors may result in a different type and duration of effects for each cannabis medicine, even when the same type of cannabis is used in their preparation. THC and CBD are the two most famous cannabinoids, but contrary to popular belief they are not actually present in fresh cannabis plants. The reason is that the plant produces all its cannabinoids in a slightly different form known as acidic cannabinoids or cannabinoid-acids. When sufficient heat is applied, cannabinoid-acids will quickly convert to their so-called ‘neutral’ counterparts by a process called decarboxylation. So when cannabis is burned for smoking, baked for edibles, or boiled for tea, THC-acid turns into its neutral form THC, CBD-acid turns into CBD, and so on for all other cannabinoids. This process is visualized in figure 3-1. Decarboxylation also spontaneously takes place in aging cannabis samples as a result of storage and exposure to light or room temperature, but at a much slower rate. For a long time, scientists considered cannabinoid-acids to be the ‘inactive’ form of cannabinoids. After all, they don’t make you feel high and do not bind to the cannabinoid receptors (see chapter 4). But at present it is known that also the acidic cannabinoids may have important medicinal properties. For example, CBD-acid has a potent antimicrobial activity and shows promising anti-inflammatory effects, while THC-acid was found to have a potent effect on the human immune system. And perhaps most interestingly, some acidic cannabinoids appear to slow the growth of certain cancers, at least in laboratory tests. For some types of patients the cannabinoid-acids may therefore not be inactive at all. When inhaled, cannabinoids and terpenes are rapidly absorbed by the lungs and distributed throughout the body. First effects generally occur within a few minutes, and gradually wear off over three to four hours. Inhalation may therefore be most suited for patients dealing with symptoms that suddenly flare up and need to be addressed rapidly, such as certain types of pain, spasms associated with MS or epilepsy, or nausea and vomiting. It is fairly easy to control the dose by inhaling; when the effect is insufficient after several minutes, you can simply take another puff until you achieve the desired effect or start feeling side effects. Cannabis can be inhaled in two main ways, smoking and vaporizing. Smoking is by far the most commonly used method of consuming cannabis worldwide, either in pure form or in combination with tobacco. Smoking enables the user to directly use the cannabis of his choice with minimal effort or cost. However, inhalation of toxic compounds during cannabis smoking may pose serious health risks due to the release of byproducts such as tar, ammonia and carbon monoxide. In many countries, the stigma attached to smoked cannabis poses a major obstacle for approval of herbal cannabis as a medicine by public health authorities. For all these reasons, smoking is not advised for the medicinal use of cannabis. Vaporizing is a technique aimed at heating cannabis to a high temperature without burning the plant material. In this way cannabinoids and terpenes are released in the form of a vapor, which can be inhaled directly. Vaporizing offers all the advantages of inhaled administration (rapid effect, accurate dosing) while avoiding the risks related to smoking. Although many different vaporizer devices are available on the market, only a few of them have been subjected to any quality testing. The Volcano® Medic vaporizer (figure 3-2) is currently the only one that has a status of approved medical device (in Canada and Germany), showing that it is a reliable and efficient device for administering cannabinoids. The miniVap (R) is another vaporizer that is currently undergoing quality testing. Because plant material is not burned during vaporizing, no active ingredients are lost and the full potential of the cannabis can be used. cannabis may also be preferred for aiding sleep, because its effect potentially last all night. A major disadvantage of oral administration is the large variability in uptake by the intestines, because the type of food you eat can have a significant influence on the absorption of the active substances. Moreover there is the inconvenience of taking oral medication in case of e.g. nausea, vomiting or lack of appetite. Dosing with oral cannabis medicine should be done carefully and slowly, because overdosing more easily occurs than with inhaled administration. Herbal cannabis can be consumed by boiling it with water, also referred to as ‘cannabis tea’. 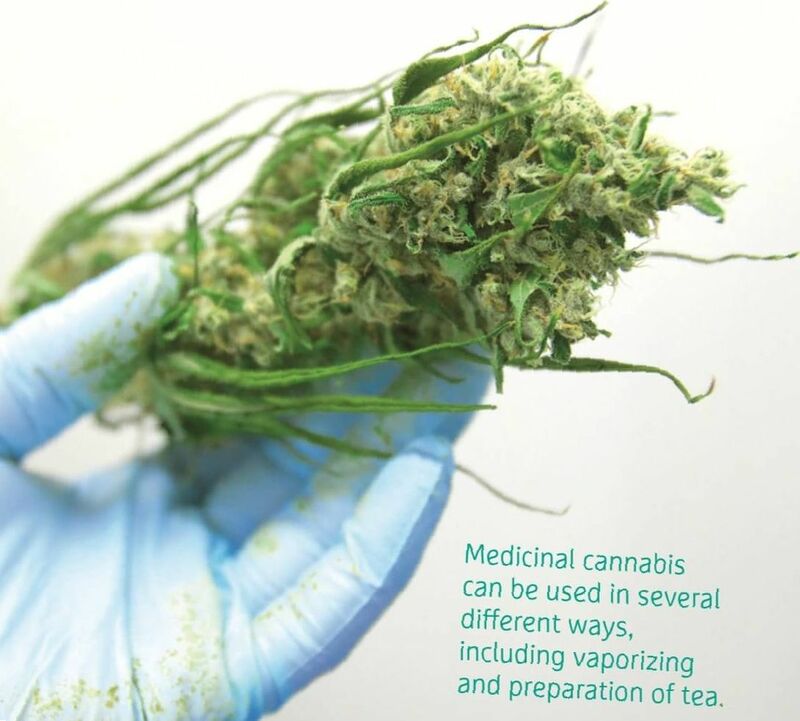 Actual methods used for cannabis tea preparation by patients are largely unknown, and many variations may exist. In the Netherlands, patients are advised to prepare cannabis tea by adding 1 gram of cannabis to 1 liter of boiling water, letting it simmer for 15 minutes, and finally filtering out solid parts by using a tea-strainer or filter paper. Studies have shown that an average cup of cannabis tea contains about 5 times more THC-acid than THC. The reason is that boiling water is not as hot as the heat applied for baking, smoking or vaporizing of cannabis. Cannabis tea should therefore not just be considered as a weak administration form of THC (which it is), but rather as an entirely different medicine, because of the presence of high amounts of acidic cannabinoids. Self-medication with cannabis in ingested forms, such as cookies, brownies or oil, seems to be particularly popular among North-American patients. Unfortunately, there currently are no scientifically approved methods available for the analysis of cannabinoids and/or terpenes in edibles containing herbal cannabis or extracts. As a result, no good scientific data is available on the potency, composition or consistency of edibles. Theoretically, issues that are likely to occur with edibles include proper mixing (ensuring one cookie has the same potency as the next), and stability of these products during storage. Consequently, the use of standardized recipes and procedures is probably even more important for edibles than for the other administration forms discussed in this chapter. Because they are so different from modern medicines, these kind of cannabis preparations are usually not used in any research projects. According to a recent international survey among almost 1000 patients, the most common problems associated with cannabis medicine are bad taste, drowsiness, uncontrollable appetite (often referred to as the ‘munchies’), and mental effects (getting high). The study also suggested that different administration forms may be preferred in the privacy of ones’ home and in public. In order to address such issues, self-medicating patients frequently experiment with new administration forms, some of which may then gather significant popularity through web forums, magazines and social media. Not surprisingly, most of these new and unconventional administration forms have never been tested for any form of quality or safety. Two of these uncommon preparations discussed below are Cannabis oil and consumption of raw cannabis. Cannabis oil is a concentrated extract obtained by solvent extraction of the buds or leaves of the cannabis plant. It is not actually an oil, but derives its name from its sticky and oily appearance. Some patients firmly believe that cannabis oil is capable of curing cancer, a claim often backed up with several anecdotal patient stories. Laboratory studies do indeed show a potential effect of cannabinoids on isolated cancer cells in a petri-dish and in lab animals, but it is too early to claim that consumption of cannabis medicine may cure cancer in the much more complex situation of human cancer. Various solvents have been recommended for making cannabis oil, such as petroleum ether, naphtha, alcohol and olive oil. A recent study comparing five commonly used preparation methods for cannabis oils found significant differences in cannabinoid and terpene composition of the final products. Also, the presence of residual solvent was found to be a significant concern, particularly in the case of using naphtha for extraction. The final conclusion of the study was to prepare extracts directly in olive oil, heated in a boiling water bath for an hour or two; this guarantees the highest recovery of active compounds, and no risk of organic solvent residues. An interesting new development is the use of raw cannabis buds and leaves, prepared as a drink by juicing them in a blender with water of fruit juice, or consumed directly as a salad. In contrast to the other administration forms mentioned above, this preparation does not undergo any form of heating, and therefore contains all cannabinoids in their original (acid) form. The possible effects of this interesting administration form have not yet been studied in any way. No matter what administration form is preferred, patients should be careful not to accidentally overdose on cannabinoids. Especially to those who have no prior experience with cannabis, the feeling of getting high may be disturbing or frightening. Other overdosing effects may cause a patient e.g. to fall (dizziness), throw up (nausea), or become disoriented. See chapter 5 for more information on effects that may be expected after consumption of cannabis medicine. It is important to find your own proper dose in order to fully benefit from the medicinal properties of cannabis. Most unwanted side effects of cannabis may be prevented by following just a few simple guidelines. The first one is to start with a low dose. It is better to take several small doses in a day that add up to a perfect result, than to experiment with one single large dose that may turn out to be too much. Second, it is important to have patience and wait for the effects (if any) to appear. Clearly, this can be frustrating in the case of acute symptoms such as strong pain, nausea or spasms, but remember that cannabis may have a different effect on each patient. In order to really evaluate what cannabis does to your medical condition, it is best to use the same (low) dose for several days, and monitor any effects that may occur. In this period you will be better able to recognize positive as well as unwanted effects. Finally, you can start to increase the dose slowly after a few days. Again: do not suddenly or quickly increase or change the dose, but take it slow and take a few days after each increase to monitor progress. In about 1-2 weeks, you should be able to find your own, personalized dose that gives you the most medicinal effect with minimum side effects. Table 3-3 summarizes the average times needed to experience first, maximum, and final effects. If you think you need an extra dose of cannabis medicine, you should at least wait until the time for maximum effect has passed: about 15 minutes for inhaled cannabinoids (vaporizing and smoking), and 2 hours for ingested cannabinoids (tea, extract or edibles).